The first few hundred metres out to the first corner are the most shallow and generally considered difficult swimming on a low tide due to heavy tough seaweed. Around the fourth (nearest to slipway) corner is also very shallow and can require a long detour if approached from the third corner on a multi-lap swim. 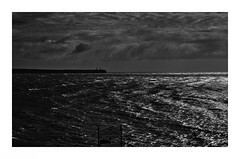 Directly across from the slipway is a small sandy beach known to local swimmers as Finbarr’s beach after Finbarr Hedderman, who was first to start using it as a feed location during his English Channel training, a practice now common to all of the local distance swimmers, and swimmers swimming out to the island towing feed boxes behind then has raised an occasional eyebrows amongst tourists. 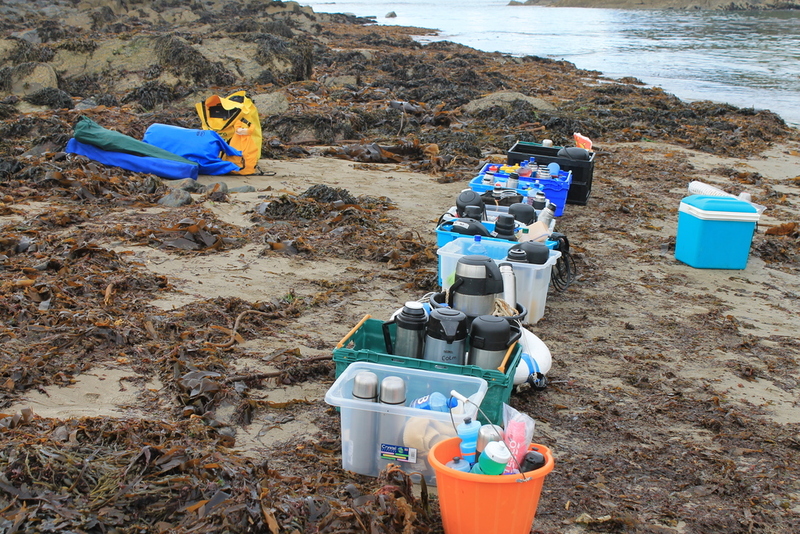 If you have not swum regularly in Ireland or the UK, it’s important to note the tidal range, which ranges from the lowest, which rises about 3.3 metres above a ocean mean of zero, on a low neap tide, to almost six metres on a high spring tide . This tidal range has a number of implications, the first of which is that already mentioned of the much-reduced swim range on the first stretch the inside of the between the slipway and the first corner. 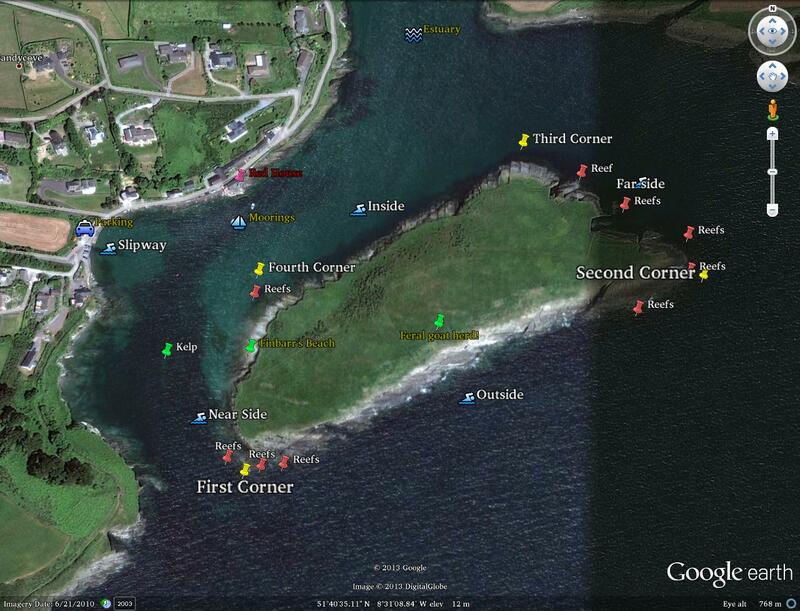 Next is the variation in distance around the island from low to high tide of two to three hundred metres. Navigation of the first and second and fourth corners changes significantly. The first corner particularly is a jumble of reefs submerged or exposed by different degrees during the tide with many rocks all around the actual reef of the corner. Only significant experience around the island combined with an indifference to contact and probable lacerations will allow safe navigation through these. The second corner is a sloping terraced reef on the approach which splays out in ridges as the corner is passed. Lacking the local experience it is best to swim wide around the first and second corners. The island is generally described as kidney-shaped, as seen in the map. Even so locals describe it as having four sides, two short (the near and far sides) and two long (inside and outside). and personal preference and speed dictates how the outside is swum. Whether close in to take a longer line, wide to avoid wave reflection off the island on lumpy days or straight to the second corner for the shortest line. Taking the straight line takes practice as initially it is difficult to see the line. Taking a close line results in swimming very close to into the terraced reefs which jut out into the sea at all tides. 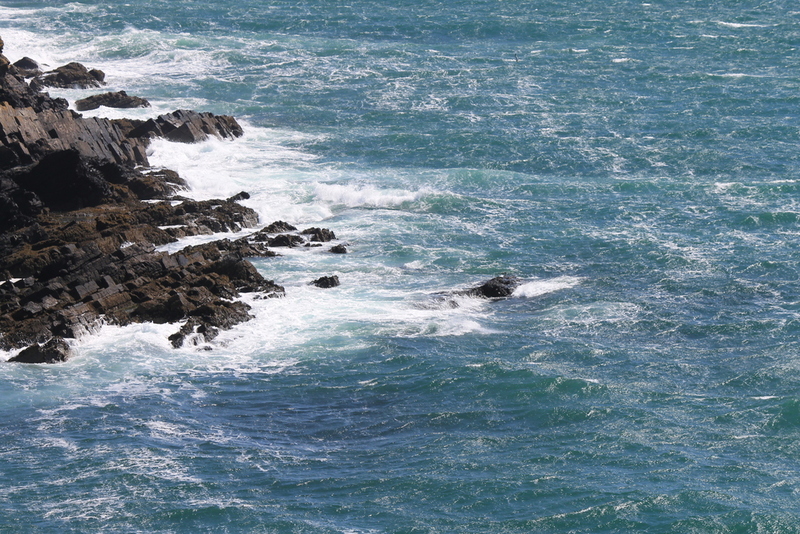 The second corner is the corner most likely to cause injury and is the one most exposed to incoming waves and swell. Most local swimmers will attest to injuries from trying to see how tight to the corner they can go, and many swimmers who get it wrong and end up on actually the reef including locals and visitors. Crab and lobster pots are occasionally placed on the outside of the island and it is possible to swim into submerged lines. The far side can be deceptive as in direct sunlight it is possible to swim into or even behind more reefs, but it is also one of the two location’s on an island location most likely to be slightly warmer. The third corner which leads around onto the inside is straightforward for swimmer and it’s possible to swim fairly close on most tides. 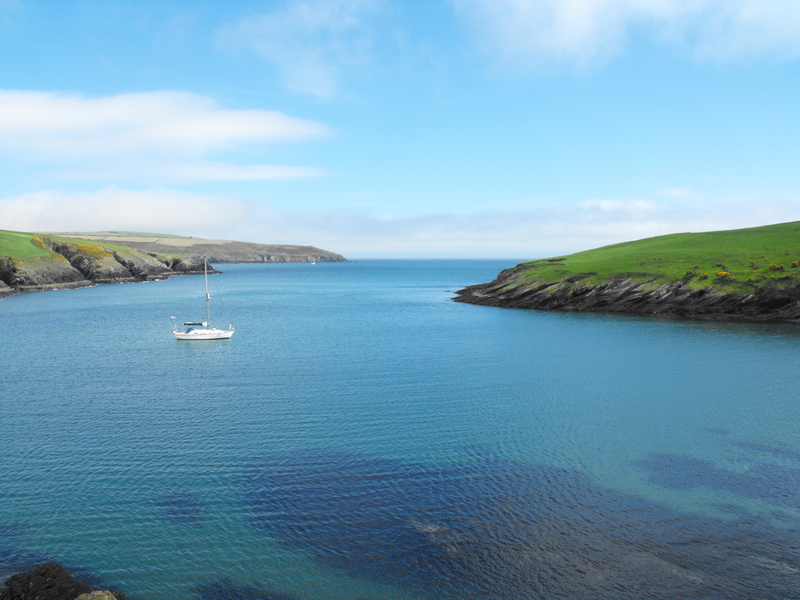 It is al important to note that boats, both powered and sail, that come out from Kinsale often power into the cove to berth and great care should be given to the real possibility of unfamiliar boats running over swimmers on the third and inside sides. For single laps, having come around the third corner there is a long straight to the slipway. the well-known Red House (well known to anyone who knows anything about Sandycove Island that is is to the right. 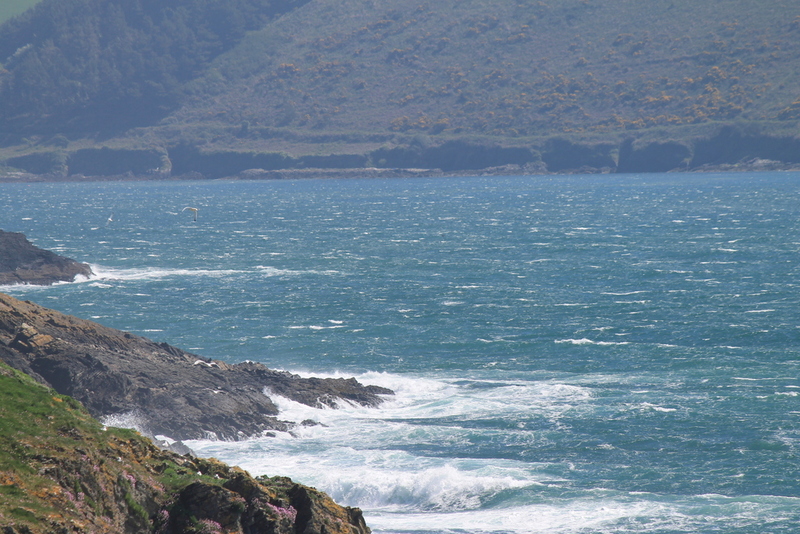 The Red House is also visible through the gap from many miles up the coast to the west). The best way to head for the slipway is a matter of debate and personal preference and can be critical in races and is also one way for the most experienced multi-lapper 500 and 100 to excel. There are boat moorings between the Red House and the island and during summer months boats are regularly moored here. For multiple laps the line to the fourth corner is straight but the lower the tide the wider the line that must be taken to get around the fourth corner or the swimmer will either swim onto sand or into the reef just past the corner, another long outward leading and mostly submerged reef which most multi-lap swimmers have swum directly into at some point. On lowest tides swell can wrap entirely around the island and produce small clean breakers inside the fourth corner. There are other wrinkles to swimming around Sandycove Island that come with time and experience. The best way to learn those is to swim with locals. Great photos and write-up, Donal. It gives a very good sense of Sandycove. That’s the best “swimmer’s map” of the island that I’ve seen! Thanks Owen. I was sure I’d get some abuse for it!